BuildBlock Building Systems provides a complete range of ICF products and accessories to ensure your ICF job is worry free. BuildBlock is the most installer-friendly ICF on the market. Save yourself time, money, and hassle from beginning to end. BuildBlock is designed to create the strongest structure and create less waste and install faster than other blocks on the market. BuildBlock ICFs are available from 4-inches to 8-inches with dedicated corners and specialty blocks. The BuildLock System is a high-performance knock-down insulating concrete form (ICF) wall system comprised of two separate 2 ½ inch Expanded Polystyrene (EPS) panels which are connected by strong, high-density plastic webs on 6-inch centers. BuildLock Knockdown ICFs fully integrate with all BuildBlock forms and are available from 4-inches to 12+ inches with our optional Bridge Clip Connector. GlobalBlock – a web optional all-foam ICF GlobalBlock is the first fully-reversible all foam ICF block of its kind. An evolution of the screen-grid ICF, it integrates seamlessly with any BuildBlock form allowing you to save time, effort, and money. GlobalBlock is a lower-cost ICF, designed without requiring an integrated plastic web. It reduces cost without losing the benefits of ICFs or affecting key structural points. The BuildDeckSystem is a lightweight, stay-in-place Insulating Concrete Form (ICF) made of Expanded Polystyrene (EPS) and used to construct a solid monolithic insulating concrete floor and/or roof decking system. BuildDeck is perfect for site-cast or precast concrete floors, roofs, decks, and walls for commercial, industrial and residential uses. BuildDeck provides structural integrity through reinforced concrete while providing comfort and sound mitigation through superior EPS insulation. When straight walls are your trademark and productivity is your reputation, there are no substitutes for using BuildBrace ICF bracing systems. ICF contractors across North America, trust BuildBrace as the most user-friendly bracing system available. 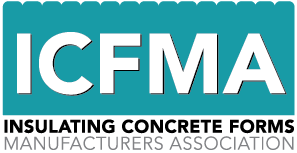 BuildCrete is a true one-coat coating system designed to adhere directly to any EPS foam, CMU block, DensGlass, Securock, concrete and other building materials. 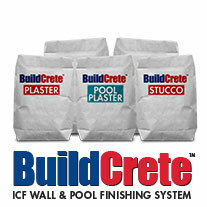 BuildCrete has been used on ICF construction for its durability, strength, and ease of application. 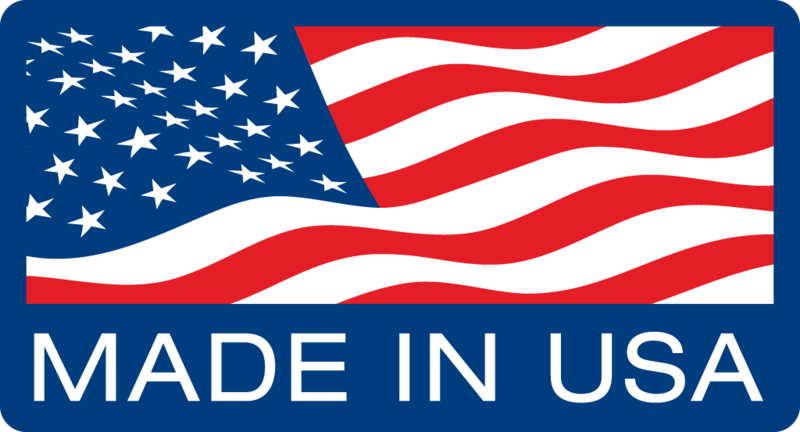 It allows contractors to be green without complexity, compromising performance, or high cost. BuildBlock ThermalSert are insulation inserts for BuildBlock and BuildLock Knockdown ICF forms. ThermalSert inserts are placed inside the BuildBlock or BuildLock Knockdown forms between each course, against the inner edge of the block’s outside wall side. Each 1-inch of foam insert adds 4.4 R-Value. BuildClip Ledge Block Web Support restores addition strength to BuildBlock ICFs when they are cut in half on one side to join a roof or decking system. BuildBlock HardWall uses BuildLock Knockdown ICFs to create an insulated ICF wall on one side and a bare concrete wall on the other. 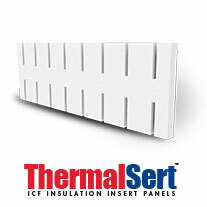 This system offers the same or greater insulation value when used with ThermalSert Insulation Inserts inside the wall cavity against the outside wall panel. This system is used primarily in commercial applications where no flammable material may be present such as emergency stairwells and elevator shafts as well as warehouses and industrial buildings where utility and impact resistance is required. BuildBuck ICF Door & Window Bucking is an integrated ICF bucking solution for residential & commercial projects. Providing continuous insulation along the full length of the buck, BuildBuck is two-inches thick providing an insulated barrier for all openings. The buck features three primary attachment areas across the face of the buck every 6-inches in the center and on each side as well as full-length attachment on each side. Foam guides properly align BuildBuck and the ICF blocks. BuildShield combines an extruded PVC plastic track with an adhesive stainless steel material applied together between an above grade course when constructing an ICF wall. The track encloses the block interlock on one side and extends into the concrete core. The other edge of the track extends outward to the edge of the wall finish. The track is scored to allow easy trimming depending on finish options. BuildShield Termite is the only ASTM E283 tested and code approved solution for ICFs in termite-prone areas. BuildBlock Building Systems is excited to introduce BuildRadius, a family of radius forms for use in ICF walls and pool construction. The BuildRadius forms create 2’, 4’, 8’, 12’, 16’, and 20’ arcs. Each of these blocks interlocks into any BuildBlock 6” product line and uses the standard BuildBlock webs. Waterproofing, radiant flooring, spray foam and foam guns. BuildBlock has all the accessories needed to make your ICF project run smoothly and with perfect results.